Mount Monadnock in the distance. Photo courtesy of NHDTTD/Jeffrey Newcomer. With its many lakes and rugged mountains, the Granite State beckons to all who love outdoor adventure. It offers excellent skiing, water sports, hiking and mountain climbing (Mount Monadnock is said to be the world’s second most-climbed mountain), all within easy reach of Northeastern cities. The open space and majestic natural scenery are also the setting for a dozen Jewish summer camps as well as Kids4Peace, for Jewish, Muslim and Christian children. And here one can encounter Jewish activities with a unique flavor, such as a havdala boat trip on Lake Winnipesaukee. New Hampshire’s first Jews were William Abrams and Aaron Moses, who arrived in Sanbornton in 1693. Portsmouth’s Jewish presence dates to 1789, with the arrival from Prussia of Abraham and Rachel Isaac, kitchenware merchants. In Manchester, a small Jewish group prayed together on Yom Kippur in 1862, but A. Wolf is said to have been the city’s first permanent settler, in 1880. The first record of a synagogue, B’nai Yeshurun, was in 1890. The congregation consisted of immigrants from Lithuania, with a few members from Ukraine. Jews lived near the Merrimack River in Manchester, on such streets as Beech, Central and Pine. In 1902, Congregation Adath Yeshurun, the former B’nai Yeshurun, bought a cottage at 94 Laurel Street and, in 1911, laid the foundations for a large frame building on Central Street with a 600-seat sanctuary. This served for nearly 50 years. When the city’s mills went bankrupt in the 1930s, Jewish textile and shoe manufacturers moved in and the Jewish community became economically important. After World War II, the Jewish population moved north in the city, and the synagogues followed. Hadassah was well established by the 1940s. Many of the Jews who arrived in Concord at the turn of the 20th century dealt in scrap metal. The businesses they built still exist, including Cohen Steel Supply; Sanel Auto Parts, founded in 1933, which became the largest independently owned auto parts supplier in New England; and Endicott Furniture, founded by the Reingold family in 1925. Bethlehem’s pollen-free air made it a haven for hay fever sufferers. But because Jews were not welcome in non-Jewish establishments, the Hebrew Hay Fever Association was established, bringing poor children from New York to its camp, and kosher hotels sprang up. Bethlehem Hebrew Congregation was founded in 1920. In the 1950s, ultra-Orthodox Jews started vacationing in Bethlehem. The town had a kosher butcher, bakery and market. Many stayed in the Sinclair Hotel, one of the big wooden hotels that once graced the town. Anti-Semitism is a stain on the history of New Hampshire. Jews were barred from hotels; Dartmouth College had a quota for Jewish students through the 1950s, and restricted Jewish enrollment at least until the 1980s. Temple Adath Yeshurun in Manchester. Photo by Esther Hecht. A positive note was the 2012 renaming of Jew Pond, in Mont Vernon. The pond got its name in the 1920s when two Jewish men bought a local hotel to accommodate Jewish guests who had been banned from the nearby accommodations. It is now Carleton Pond. Though New Hampshire is slightly larger than New Jersey, it has only about 1.3 million residents. Its biggest cities are Manchester and the capital, Concord. Estimates of adult Jews range from 10,000 to 25,000—many of them from elsewhere originally. Of Portsmouth’s Temple Israel congregation, only 25 percent are from old local families. The state’s 15 congregations and 4 havuras have many flavors. The rabbis meet monthly to discuss ideas and problems, including how to manage their spread-out communities. They often share their pulpits with colleagues, and some congregants belong to more than one synagogue—even of other streams. Changing demographics are affecting some congregations. In Manchester, for example, the wealthier, older members of Reform Temple Adath Yeshurun are retiring and moving away, and younger, less affluent families are joining. Temple Beth Jacob in Concord is a growing Reform congregation largely because its members include many government-employed and private lawyers and workers at the city’s highly rated medical center. Seasons, too, affect synagogue life. Bethlehem Hebrew Congregation’s main activity is in the summer months. Temple Beth Jacob often has visiting Sabbath-observant worshipers who are on their way to ski resorts. The Monadnock Havurah (formerly the Peterborough Havurah) started in 1996 as a social gathering of Jewish families and later evolved to include topics of discussion, with meetings in members’ homes. Today, it numbers 50 individuals and meets monthly for a potluck dinner and havdala, and members celebrate holidays together. At Dartmouth College in Hanover, the Roth Center for Jewish Life is home to the Upper Valley Jewish Community and an active Hillel chapter that sponsors Project Preservation—a program to document and clean Jewish graves in Poland. New Hampshire has about 1,000 Hadassah members in six chapters: Manchester, Concord, Seacoast, Southern New Hampshire, Dover and Upper Valley. But only Manchester and Concord are active (region.nne@hadassah.org; 781-455-9055). 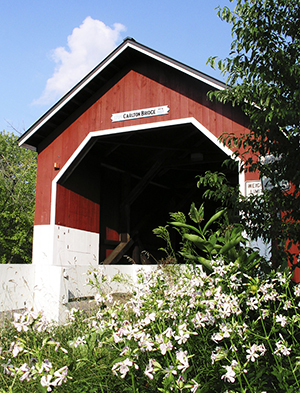 Covered bridges—like this red one in Swanzey—dot New Hampshire’s majestic landscape. Photo courtesy of NHDTTD/Jeffrey Newcomer. The Manchester-based Jewish Federation of New Hampshire serves the entire state (603-627-7679). The federation organizes the Jewish film festival, provides social services, sends teenagers to Israel on various programs and publishes a monthly newspaper, The New Hampshire Jewish Reporter. Red covered bridges, outstanding wildlife, lakes, the White Mountains and the Atlantic seacoast are all reasons to come to New Hampshire (visitnh.gov). On the seacoast, just one hour’s drive northeast of Boston, Route 1 enters Portsmouth, where it becomes State Street. A plaque on the red house at 414 State Street says this was the home of Abraham Isaac, ca. 1800. At 200 State Street stands Portsmouth’s red-brick Temple Israel, New Hampshire’s first permanent house of worship. It was established in 1910, and soon after moved into a former church. On the front façade, the tablets of the law appear just below the gable. In an entry hall, folded notes fill the cracks of a miniature version of the Western Wall. The sanctuary has been preserved as it was following a renovation in 1920—dark wooden pews contrasting with the white walls. A small Holocaust memorial has been added to one wall. The egalitarian Conservative congregation has 300 families, 92 children in religious school and 12 in preschool. A five-minute walk leads to Strawberry Banke, a living museum of restored homes, exhibits and gardens on a site that housed immigrants for more than 300 years. In the white Shapiro House, built in 1919 and whose doorpost is marked by a mezuza, an actress portrays Sarah Shapiro, an immigrant from Ukraine. She can describe every aspect of the family’s life, including the chicken soup she is preparing for Friday night dinner, along with mandelbrot, rhubarb rugelach, brandied peaches and vodka cherries. Signs and objects throughout the house augment her descriptions. Recent excavations at Strawberry Banke uncovered a mikve that had been in the basement of another house. 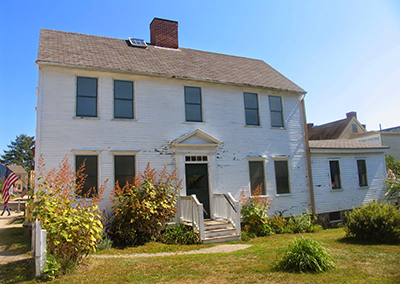 The Shapiro House at Strawberry Banke in Portsmouth. Photo by Esther Hecht. The New Hampshire Holocaust Memorial stands in Nashua, about one hour’s drive southwest of Portsmouth. The moving force behind the memorial is Fred Teeboom. More than 100 members of his extended family were killed in Auschwitz; he and his immediate family were hidden by devout Dutch Christians during World War II. Teeboom now lives in Nashua, where the memorial, created by sculptor John Weidman, was dedicated in 2014. 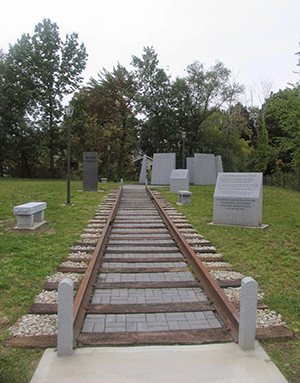 A train track leads to the central sculpture, consisting of six granite walls, each symbolizing one of the primary Nazi extermination camps. The walls surround a brick column, representing the crematoria chimneys, topped by a polished granite cube in which visitors can see their own reflection. Located on land given and cleared by the city at 315 Main Street in Rotary Common Park, this is the first stand-alone Holocaust memorial in the state. Manchester is half an hour’s drive north of Nashua. Temple Adath Yeshurun (152 Prospect Street) has 225 households and 50 children in its religious schools. The Modernist building is faced in brick, with a large concrete sculptural element on one side and a sweeping, overhanging roof. In the sanctuary, the bima combines red and white brick with blond wood and a modern Ark cover. In the garden, a granite-and-bronze Holocaust memorial by artist Armand Szainer, a Holocaust survivor, depicts three figures representing a family, embracing as they rise in smoke. 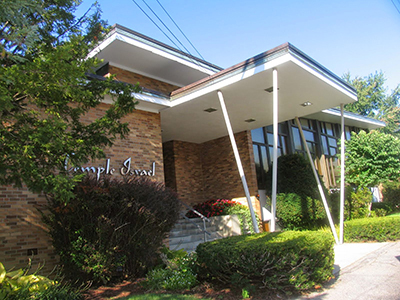 Temple Israel (egalitarian Conservative), half a mile north at 66 Salmon Street, with 75 families and a Hebrew school with 30 children, prides itself on its daily minyan, a 25-year tradition. Its building has a futuristic brick exterior. In the sanctuary, the bima combines brick walls, blond wood and a stylized Ark cover. The congregation arranges monthly Friday night kosher dinners as well as lunch after Saturday morning services. Temple Israel in Manchester. Photo by Esther Hecht. The Currier Museum of Art (150 Ash Street), one block south of Temple Adath Yeshurun, features European and American art. Among the Jewish artists whose works are displayed are Hans Hoffmann, Jacques Lipchitz, Lyonel Feininger, William Zorach, Sol LeWitt and Mark Rothko. Also part of the museum, but in a separate location, is Zimmerman House, the only Frank Lloyd Wright-designed house open to the public in New England, containing the Zimmermans’ own collection of art. Manchester’s history is inextricably linked to the Amoskeag Manufacturing Company, one of the largest textile producers in the world, whose mill yard in 1876 stretched for a mile along the Merrimack River. That history, including the story of the city’s Jewish residents, is told eloquently in the Millyard Museum (at the corner of Commercial and Pleasant Streets), where the exhibits include the sign of S. Stahl and D.G. Stahl, dentists, and the talis and bag used by one Louis Rosenblum. Today, the mill yard is home to high-tech and other companies, artists’ studios and restaurants. The MacDowell Colony was founded in 1907 in Peterborough—an hour’s drive east of Manchester—by composer Edward MacDowell and his wife, pianist Marian MacDowell. It is one of the oldest artists’ colonies in the country. Its 6,000 fellows have included Leonard Bernstein, Aaron Copland, Stephen Sondheim and Jonathan Franzen. Novelist Michael Chabon chairs the board of directors. The colony’s studios are open to the public once a year in August, and the fellows share original works with the public through its monthly MacDowell Downtown programs. Save time to stroll through and shop in quaint Peterborough. Photo by Esther Hecht. Peterborough’s Main Street was the site of the Village Pharmacy, the town’s first Jewish-owned business. From the 1950s to the 1970s, customers could listen to records of Bach or opera played by pharmacist Myer Goldman (who was also the cantor in neighboring Keene). MacDowell Colony residents congregated at its soda fountain and sometimes paid for prescriptions with art. In Concord, less than half an hour’s drive north of Manchester, Temple Beth Jacob is a white shingle structure with a gable roof (67 Broadway). In the sanctuary, the blond wooden Ark fits into a pyramidal niche and is faced with a colorful silk cover. Displayed on one wall is the memorial board of Berlin’s disbanded Congregation Beth Israel. 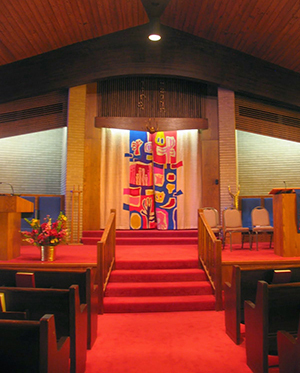 Founded in 1907 as an Orthodox congregation, Beth Jacob has been Reform for many decades. The temple has 210 member families, 100 children in its religious school and a teen group. 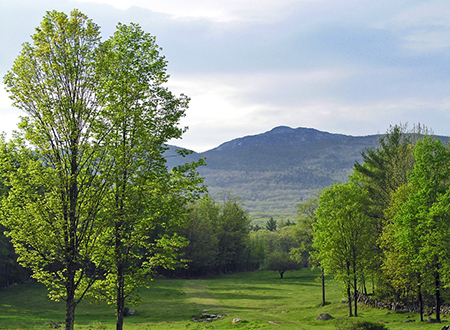 Less than a 90-minute drive north of Concord lies Bethlehem, surrounded by the majestic White Mountains. In 1929, Bethlehem Hebrew Congregation took possession of a church building it had bought at 39 Strawberry Hill. The distinctive white building, revamped in 1999, has a gable roof. The sanctuary features twin stained-glass windows flanking an Ark. The beams, pews, bima and Ark are constructed of blond wood. The unaffiliated egalitarian congregation consists of about 90 people. The all-year people are very spread out, “hidden Yidden in the hills,” as they call themselves. Many are children and grandchildren of the original members. Summer is the high season, when a rabbi is present; in other months, congregants celebrate the Jewish festivals together. Additional congregations, havuras and minyans are scattered throughout the state. Joseph and Charles Revson, of Manchester, founded Revlon Cosmetics in the 1930s. J.D. Salinger, best known for his novel The Catcher in the Rye—a controversial, partly autobiographical story of adolescent alienation—lived much of his adult life in Cornish. Comedian, actor, screenwriter and producer Adam Sandler grew up in Manchester. Sarah Silverman grew up with her siblings in Bedford. While Sarah became a controversial and well-known comedian, her older sister, Susan, who has been quoted as saying “We thought growing up Jewish in New Hampshire just meant you were a Democrat,” became a well-known rabbi who lives in Jerusalem. The New Hampshire Holocaust Memorial in Nashua. Photo by Esther Hecht. Jodi Picoult’s The Storyteller (Atria), set in a small New Hampshire town, weaves together the tales of a young baker, her grandmother who is a Holocaust survivor, an aging Nazi and a Nazi hunter. Picoult lives with her family in Hanover. Rabbi Joshua L. Segal’s The Jewish Cemeteries of New Hampshire (Jewish Cemetery Publishing) includes brief histories of all the state’s Jewish communities. Claremont Boy: My New Hampshire Roots and the Gift of Memory (Bauhan) contains columns by Joseph D. Steinfield originally published in the Monadnock Ledger-Transcript. Among the stories told by Steinfield, who grew up in one of a handful of Jewish families in Claremont, are tales of his immigrant relatives, their success and their patriotism. In John Irving’s The Hotel New Hampshire (Ballantine), Win Berry turns an abandoned girls’ school into the eponymous hotel. Later, Berry moves to Vienna, where he joins his old friend Freud, a Viennese Jew, in running a hotel to which he gives the same name. Portsmouth offers attractive shops, cafés and restaurants surrounding its historic harbor. Nearby Hampton Beach has plenty of sand for sunbathers. Peterborough is a browser’s delight, especially for antiquers. 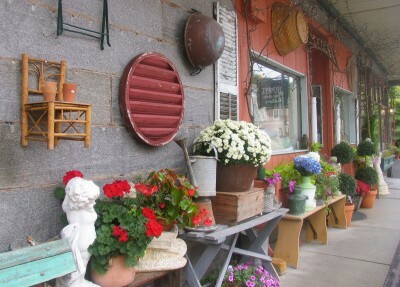 In the Downtown Historic District, check out Grove and Main Antiques (4 Grove Street; 603-933-0639). Step into the huge Toadstool Bookstore (3 Main Street), which has both new and used books and even a Judaism section. And visit Sarah’s Hat Boxes (36 Grove Street in Peterborough)—with boxes in every size and color—whose customers include fashion designer Isaac Mizrahi as well as Hasidim. Some supermarket chains, such as Price Chopper and Hannaford, carry kosher products. For a mountain getaway, try Bethlehem’s The Mulburn Inn, a friendly, Victorian-style bed-and-breakfast. And what could resonate more with today’s Jews than the outspoken motto of New Hampshire, famously emblazoned on every license plate: Live free or die. excellent review of jewish new hampshire.. never been there yet, but would like to go! Really enjoyed this piece but where are Dover Temple Israel and Nashua Temple Beth Abraham ? Small correction: Nashua is southWEST of Portsmouth. If you went southeast of Portsmouth, you’d be riding the whales in the Atlantic Ocean! You are correct, and I have taken her out of the listing of Jewish artists. Good article. Sorry you didn’t have room to write about Chabad. The only active Hadassah chapter in NH at this time is the Manchester one. Accurate ( except aforementioned)and well written. Thanks for writing such an informative article. I enjoyed reading it. Missing is mention of the very large summer Jewish presence around Bethlehem in the Fifties, plus and minus a number of years. Many of the hotels were clearly Jewish, the non-Jewish hotels equally clear. Largely, they were occupied by folks from New York escaping the summer’s heat and hay fever. Smaller contingents came from Boston and Quebec. The larger hotels were a cross section of Jews, while a number of rooming houses catered to the Orthodox. There were several nearby towns where Jews were not particularly welcome guests. There was also a large, Jewish bungalow colony, Stonecrest. how about Keene, NH ? -Congregation Ahavas Achim, now celebrating our 100th year since incorporation. As a Jew who attended Dartmouth in 1970/71, I must comment on the statement “Dartmouth College had a quota for Jewish students through the 1950s, and restricted Jewish enrollment at least until the 1980s.” There is much to unpack within this statement. In fact, the history of restricted Jewish admisions at Dartmouth has been well-documented and discussed, particularly during the period up through the 1940s, including by the James Freedman, the late Jewish President of Dartmouth. The post-war period is the interesting one, because – as far as I can determine – there were no official Jewish restrictions at Dartmouth. What there was, instead, was an official – and publicly stated – “geographic diversity” policy that actively and openly discriminated in favour of young men (Dartmouth did not become co-ed until the late 1970s) from places like Wyoming, Montana, Indiana, Texas, Alaska, Idaho, Kentucky, etc. That geographic diversity became effective discrimination against Jews (and probably, so a certain extent, against Catholics), because Dartmouth discriminated against people from New Jersey, New York, Connecticut, Massachusetts, Maryland, etc: a de facto Jewish quota. Even today, Dartmouth is last in the Ivy League in the percentage of Jewish students: Dartmouth’s remote location and lack of any significant nearby Jewish community would naturally reduce its attractiveness to many Jews, but the long history of few Jewish students means that there are very few “legacies” – Jewish kids whose parents went there, and that will take many decades to change, if ever. until very late in the game because these volumes were published in 1889.